FEV (forced expiratory volume). FEV is the volume of air exhaled after a short period of constant effort. When this test is done over a one-second interval, it is known as FEV1. FVC (forced vital capacity). FVC is the volume of air exhaled by a forced maximal exhalation after a full inhalation. TV (tidal volume). TV is the volume of air inhaled and exhaled at rest. The Spirometer comes with a detachable Flow Head that can be removed for sterilization or replacement. Push on the latches at the top of the handle until they splay outward. Pull up on the Flow Head and remove it from the handle. Push in the two latches at the top of the handle so that they splay outward. Line up the two small holes on the base of the Flow Head with the two ports inside the top of the handle. Press down firmly on the Flow Head until it securely attaches to the handle. Push the latches in to lock the Flow Head in place. The Spirometer can be used for inspiratory and expiratory experiments. Use the following mouthpieces, filters, and Flow Heads for the type of experiment you are doing. Use a disposable cardboard mouthpiece and a disposable bacterial filter with the Spirometer for experiments in which the students inhale and exhale through the Spirometer. Attach the bacterial filter to the side of the Flow Head marked “Inlet” and attach the cardboard mouthpiece to the bacterial filter. In an ideal situation, every student would have his or her own bacterial filter and disposable mouthpiece. According to the manufacturer’s specs, the MicroGard® filters out more than 99% of bacterial and viral aerosols. Ensure that the person being tested is breathing only through his/her mouth. The person can use a nose clip or hold his/her nose. Connect a disposable bacterial filter and a disposable mouthpiece to the clear plastic Flow Head on the side labeled "Inlet". Hold the Spirometer vertically and still during use. For best results, zero the spirometer before use and start data collection during exhalation. Here are a few examples of experiments that can be conducted with the Spirometer. A student’s normal, resting breathing pattern is measured by a Spirometer. A graph of the data shows the student breathing in (inspiration) and breathing out (expiration). The graph shows typical results of the flow rate during a normal breath and a deep breath. A student’s normal, resting breathing pattern is measured. A graph of the data shows the volume of air the student breaths in (inspiration) and breaths out (expiration). The overall process is referred to as ventilation. Tidal volume is the amount of air that a person breathes in with a normal breath. In this activity, the student exhales forcefully and very quickly into the Spirometer, and then inhales. The graph of this event, shown here, allows the student to determine his/her forced vital capacity. The graph is a plot of lung volume (x-axis) vs. flow rate (y-axis). The data may also be examined to determine Forced Expiratory Volume after 1 second (FEV1). You should not have to perform a new calibration when using the Spirometer. We have set the sensor to match our stored calibration before shipping it. You can simply use the appropriate calibration value that is stored in the data-collection program. For the most accurate measurements with this sensor, we recommend adjusting the calibration using a 2 L syringe. This is a simple process that takes only a few minutes. Note: This sensor is equipped with circuitry that supports auto-ID. When used with LabQuest 2, LabQuest, LabQuest Mini, LabPro, Go! Link, SensorDAQ, TI-Nspire Lab Cradle, EasyLink, or CBL 2, the data-collection software identifies the sensor and uses pre-defined parameters to configure an experiment appropriate to the recognized sensor. The manufacturer recommends three methods, in the following order, with which to sterilize the Flow Head. Wash the detachable Flow Head in a dishwasher. It is dishwasher safe. This method provides the longest life for the Flow Head and is the method most recommended by the manufacturer. Cold sterilize the Flow Head with a surface disinfectant such as Cidex® or Technical Tincture of Green Soap®. These are available from medical supply or janitorial supply companies. Autoclave the Flow Head. This method provides the shortest life span for the Flow Head. The nose clips should be wiped clean between uses and soaked in a mild detergent after each experiment. In the center of the Flow Head is a mesh screen. As air is forced through the Flow Head a slight difference in pressure occurs between the front and the back of the screen. A tube in front of the screen and a tube behind the screen pass the pressures to a differential pressure transducer. The greater the airflow passing through the screen, the greater the pressure differential. Airflow rate (L/s). is measured directly. Volume (L) is calculated by integrating the flow rate (L/s) as a function of time (s). 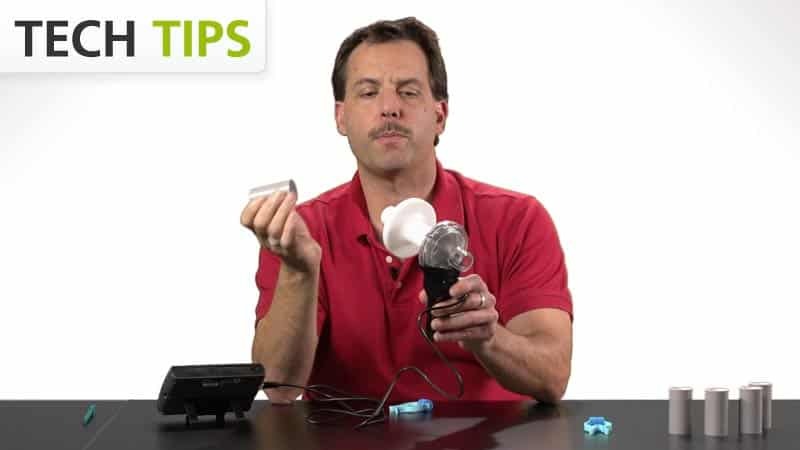 If you have watched the related product video(s), followed the troubleshooting steps, and are still having trouble with your Spirometer, contact Vernier Technical Support at support@vernier.com or call 888-837-6437. Support specialists will work with you to determine if the unit needs to be sent in for repair. At that time, a Return Merchandise Authorization (RMA) number will be issued and instructions will be communicated on how to return the unit for repair. Vernier warrants this product to be free from defects in materials and workmanship for a period of five years from the date of shipment to the customer. The replaceable Flow Head, manufactured by BIOPAC Systems, Inc., carries a 12 month warranty and is not subject to a separate warranty by Vernier. This warranty does not cover damage to the product caused by abuse or improper use. This warranty covers educational institutions only.